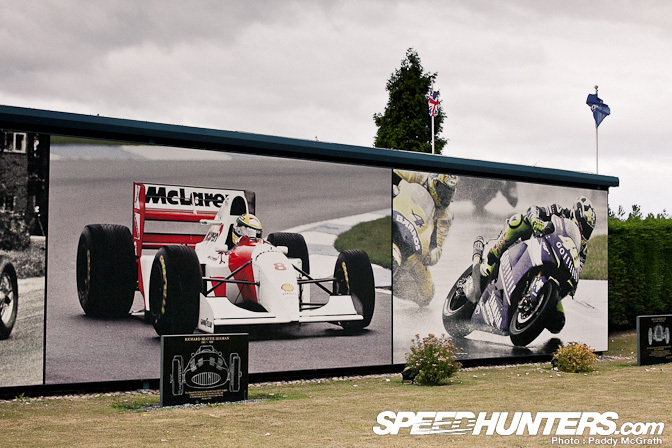 It’s been over three years since a Speedhunter last set foot inside the world’s largest collection of Grand Prix cars, so when passing Donington one morning in August, I couldn’t resist dropping in for my own first visit. 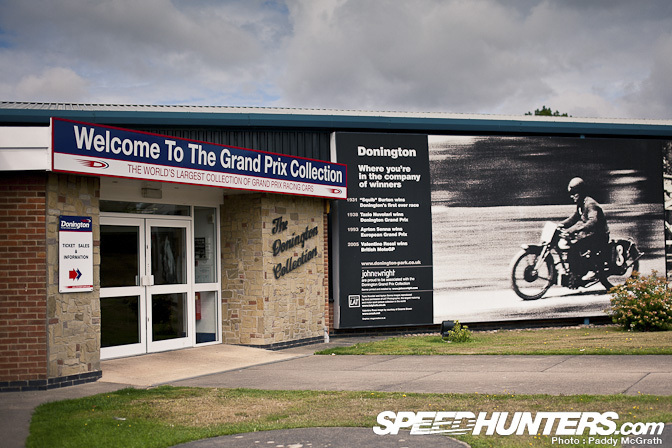 I’ve been to Donington a couple of times in the past for Prodrift and JDM Allstars events, but could never find the time to visit this rather humble looking museum. 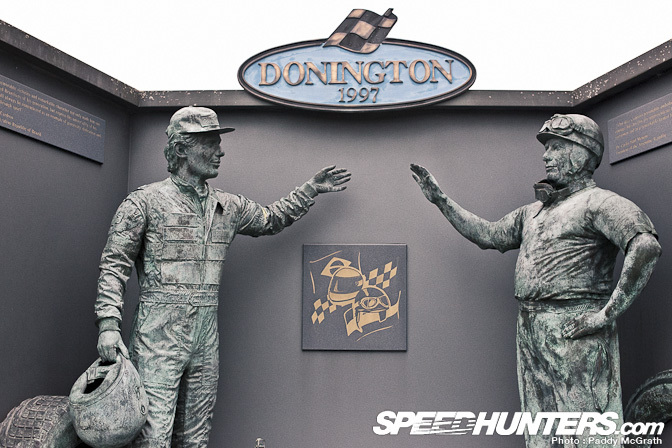 Donington Park has quite an illustrious history with Formula One and has featured some amazing battles over the years, the most famous of which being Aytron Senna’s absolutely incredible opening lap at the 1993 Donington Park GP. 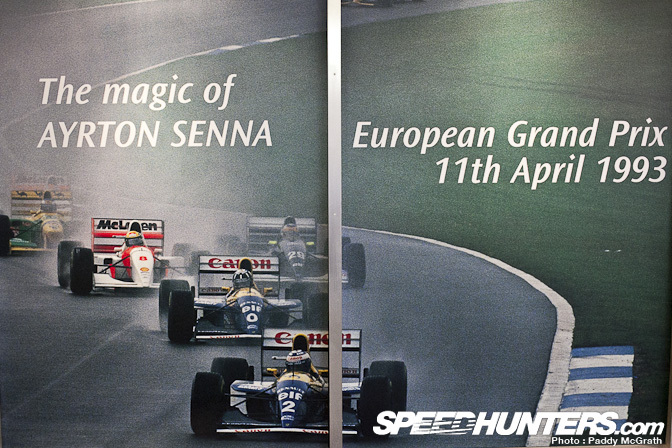 Starting from fourth on the grid, Senna briefly dropped back to fifth before overtaking Schumacher, Hill and Prost in quick succession on a rain soaked Donington before continuing on to take the win. Rather surprisingly, the first exhibition you are greeted with once you step inside the first of five halls is that of past military machinery, most of which seems to be from World War II. 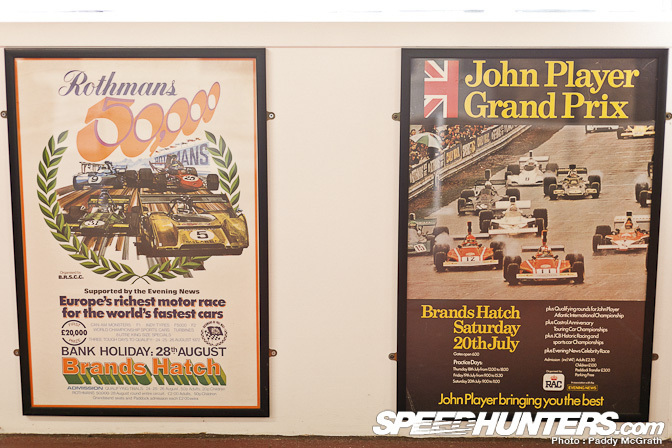 … and original items of ephemera from past Grand Prix events, you’re immediately filled with a great feeling of nostalgia. 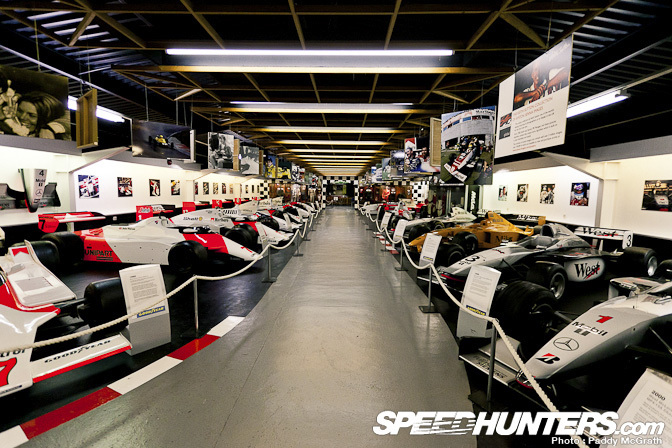 Once you’ve stepped inside the first hall of Grand Prix cars, it is a complete sensory overload. It does take some time to adjust to the fact that these are all fully functional racing cars, all of which have seen competition. If those spoilers could tell stories, eh? 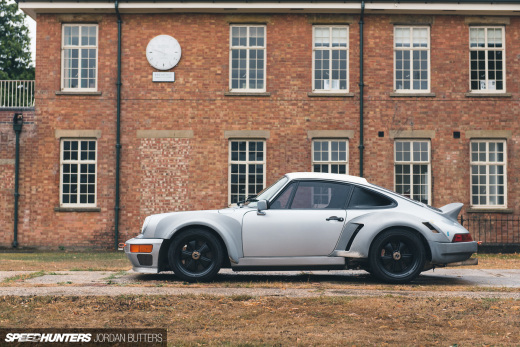 The collection was started in 1973 by Tom Wheatcroft and was originally based around his own personal collection of racing cars. 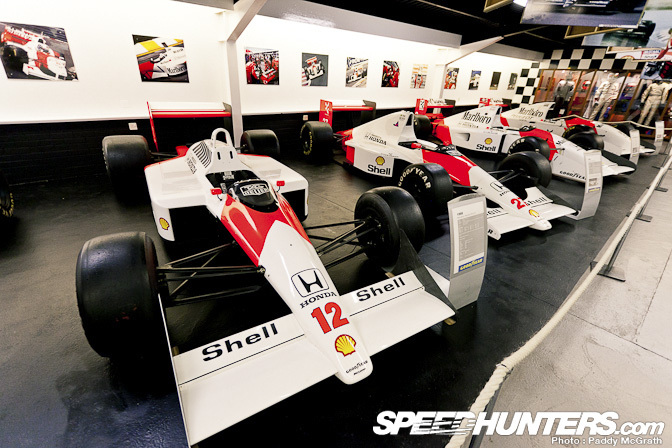 Over the years, more cars have been added with others having been donated on loan to ensure the museum retains the title of the ‘world’s largest collection of Grand Prix cars’. 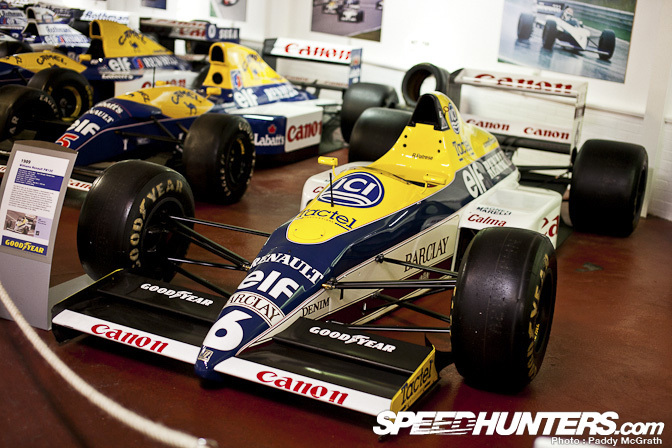 Walking through the museum allows you to examine first hand the evolution of the GP car. 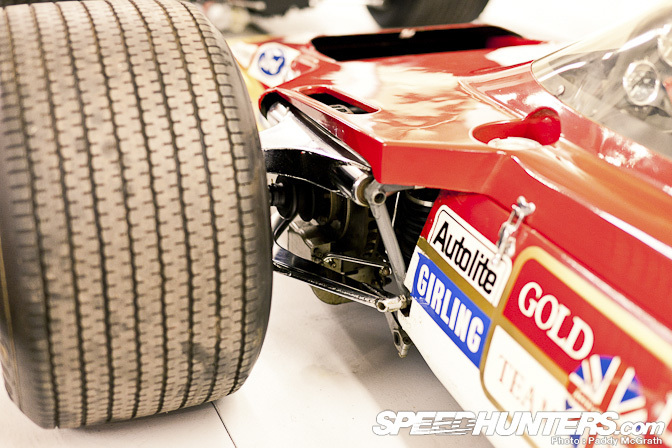 It’s not very often you see front driveshafts on a GP car but this was the Lotus 63 4WD. There are also reminders of the dangers of the era. This particular exhibition was a tribute to David Purley, who held the rather the dubious honour of holding the Guinness World Record for suffering and surviving the highest deceleration G-force. 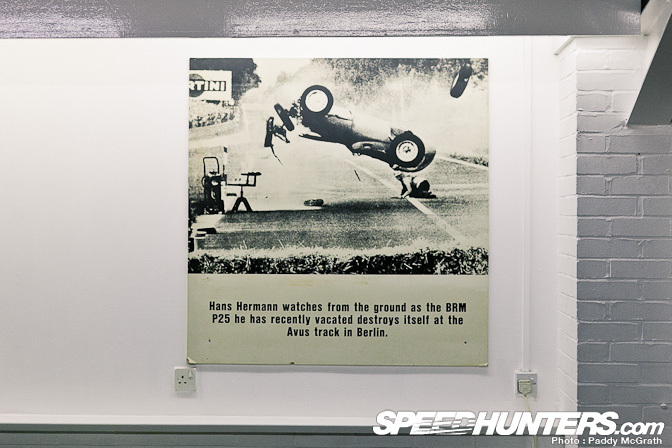 His car struck an outside barrier at Silverstone and came to a complete stop from 110MPH within one single car length. 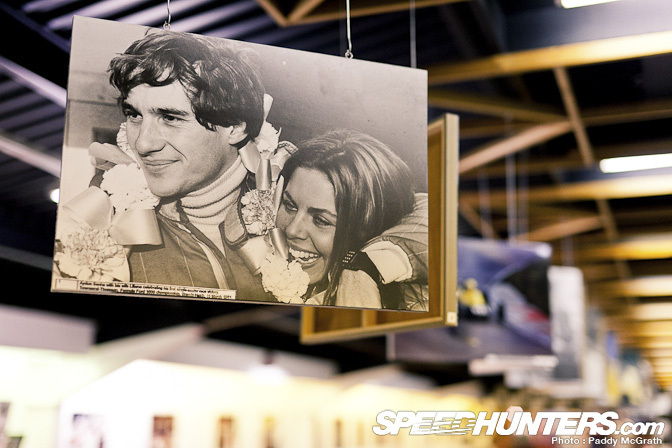 Purley is better remembered for his brave and valiant attempt at trying to save the life of fellow competitor Roger Williamson who became trapped in his burning car at the 1973 Dutch GP. When looking at old photos and videos from the era which these cars originate from, it’s hard to appreciate the beauty of them. 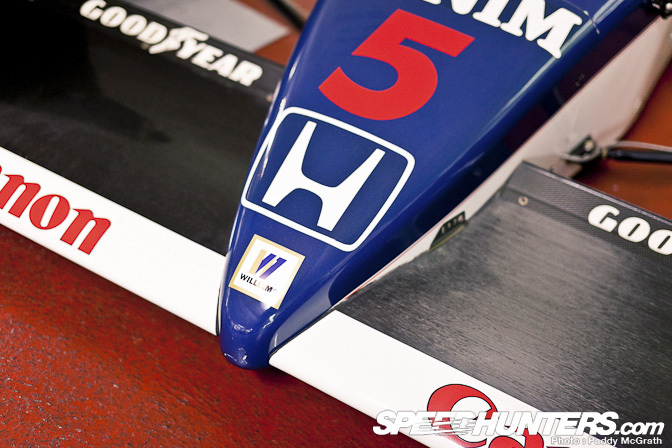 These were cars designed by man and not shaped by wind tunnels and there is definitely an attractive quality about that. With so much on offer, it’s difficult not only to take it all in but to convey the amount of history within the walls of the building. 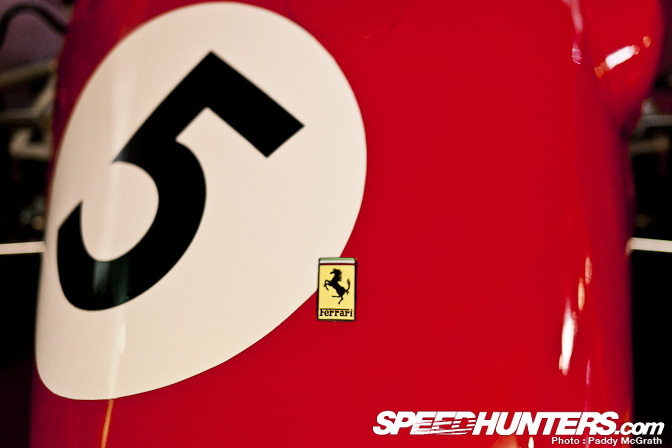 The 1952 Ferrari 500 at the hands of Alberto Ascari won every single race it entered in 1952 and five of the eight it entered in 1953. 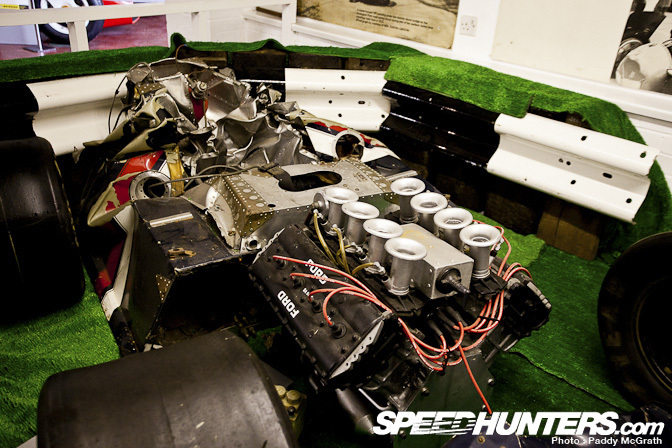 Powered by a two litre, four cylinder and eight valve engine it made around 170BHP at 7,000RPM. Ascari was the last Italian to win a world driver’s title. 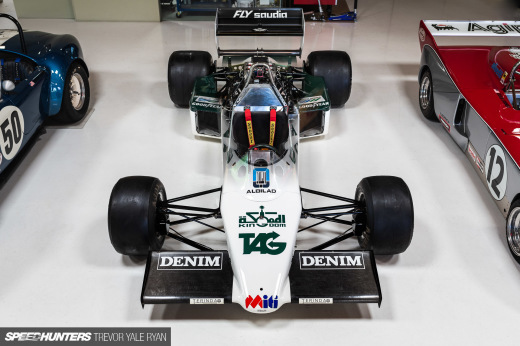 By covering so many eras in detail, not only can you witness the evolution of F1 as a whole but you can also see the developments made by individual teams over the years. Something which is hard to see when viewed separately becomes quite obvious when viewed side by side. 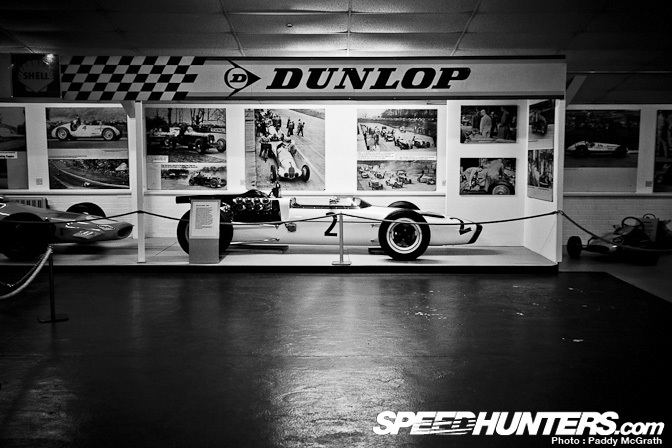 The hall features an amazing collection of photographs placed both above and behind the cars which were donated by Sutton Images. 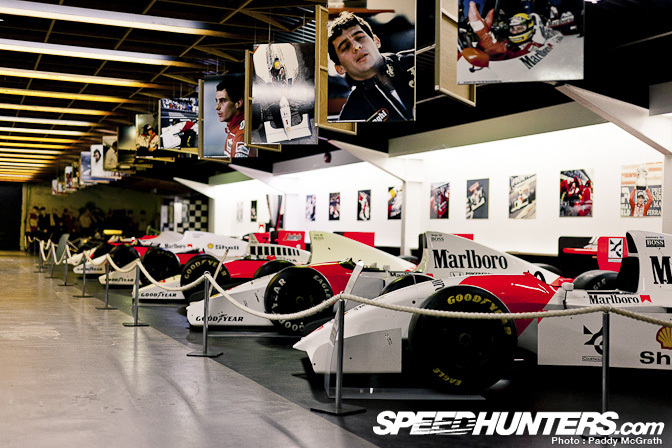 With the huge publicity surrounding the release of the Senna movie, could there be a better time for a dedicated exhibition? Standing in the same room as this collection of cars is quite emotional. The iconic red and white liveries evoke a strong sense of emotion for a time that has passed but thankfully is still remembered. 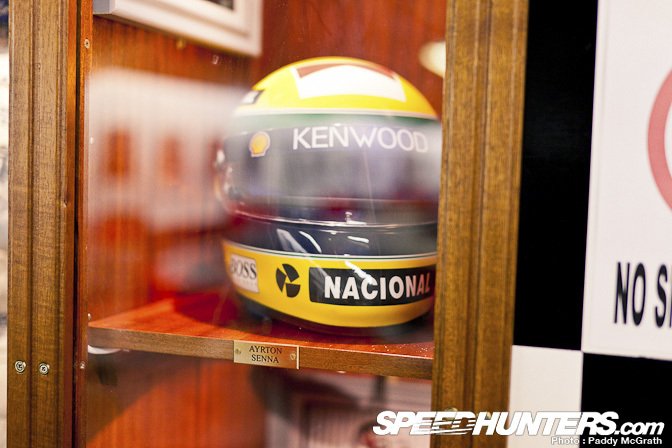 For most of us, that yellow helmet coupled with the red and white livery evokes the strongest sense of emotion of all. 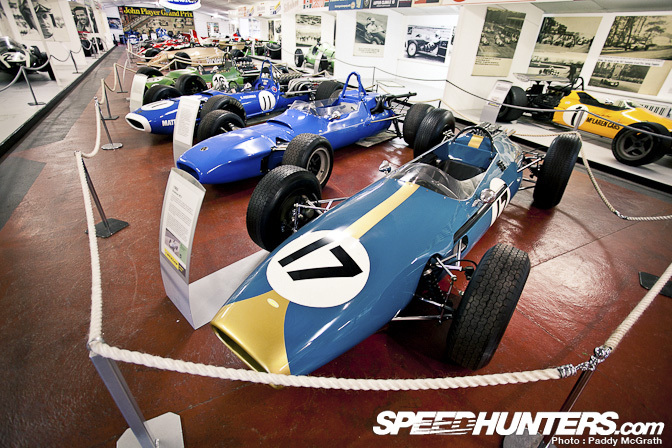 The final hall predominantly hosts a collection of BRM cars. 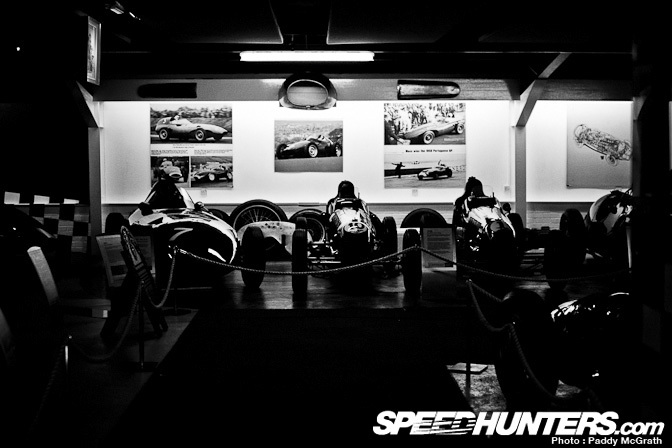 Being a photographer it’s hard not to be distracted by the photographs which adorn the walls of the museum. 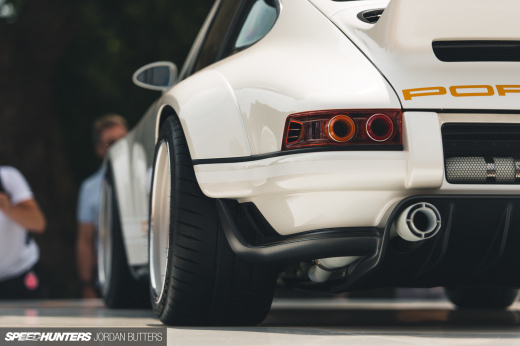 I can’t even begin to comprehend how difficult it would be to capture a shot like this back in the day – there was no continuous drive of ten frames per second burst to assist you, you had one chance and that was it. 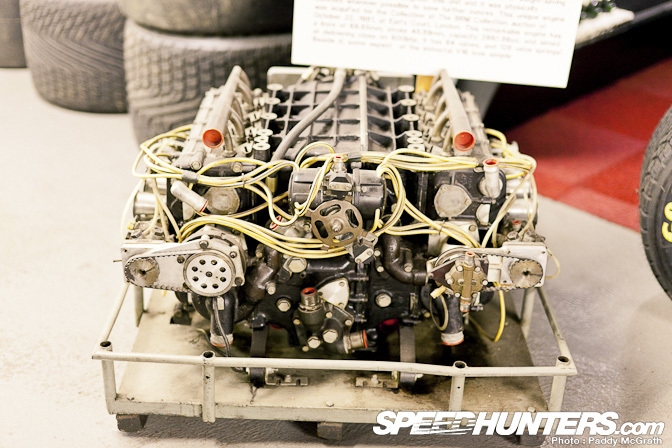 I thought some of you might be interested in this BRM H16 engine. 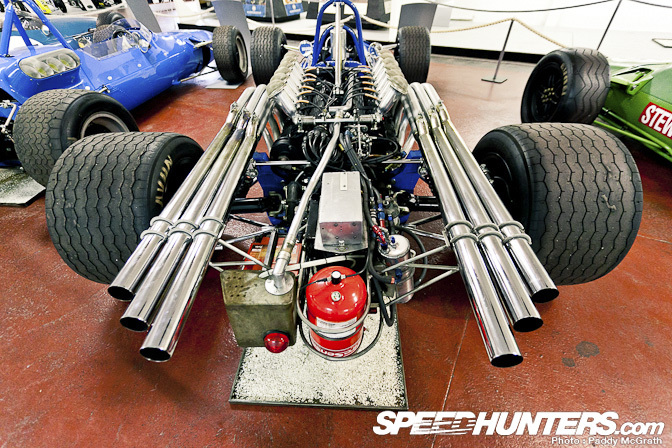 It’s essentialy two flat eight engines with two cranks geared together and an overall capacity of three litres. 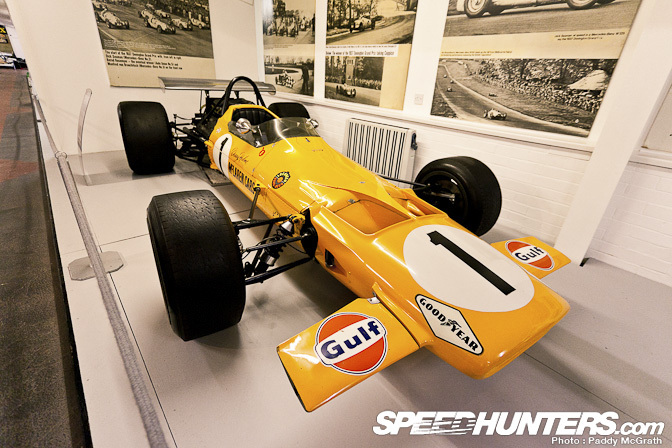 It was never particularly successful mostly due to its weight but did win one race at the hands of Jim Clark in a Lotus 43. 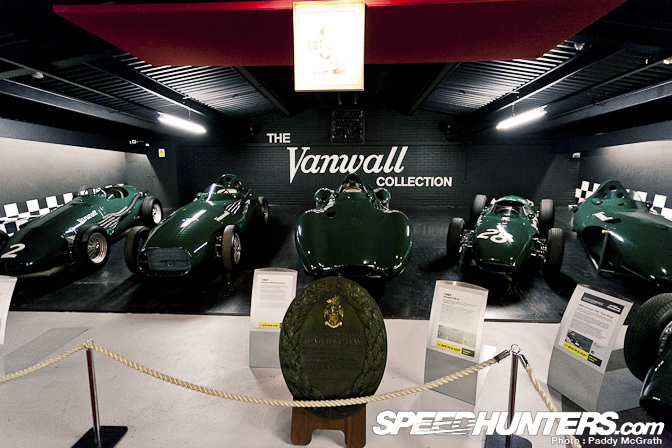 The collection is also host to the only complete collection of Vanwall racing cars – a British GP team founded in the 1950s which had considerable success including building the first British car to win a World Championship race and becoming constructors champion in 1958. 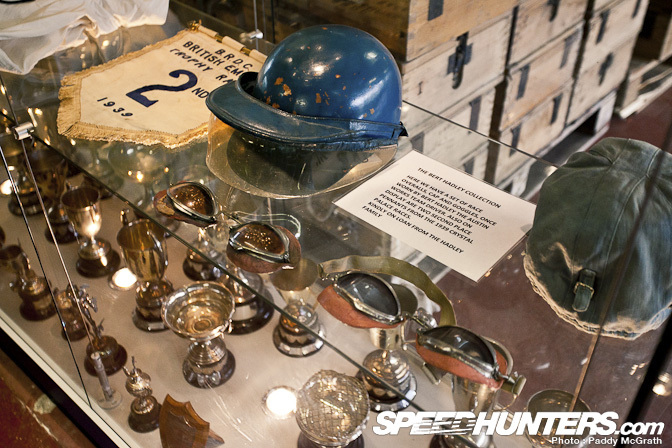 After the death of team founder, Tony Vanderwell, the team eventually ceased racing in 1961. Although I was against the clock on the day I visited, I still picked up a lot of information that I may never have come across otherwise. 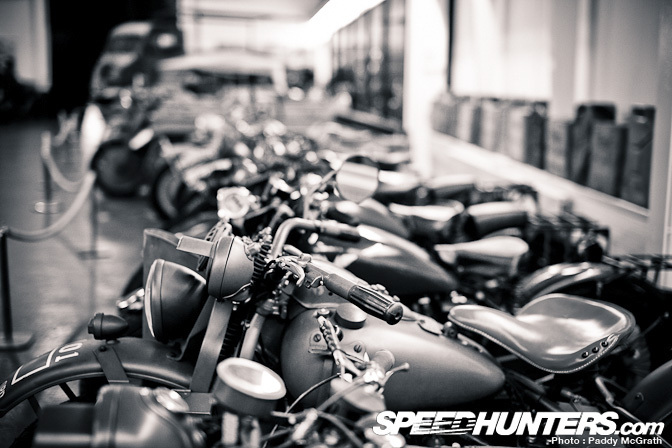 There is a lot to be learned from this collection and if you’re ever in the area, you won’t regret a visit. 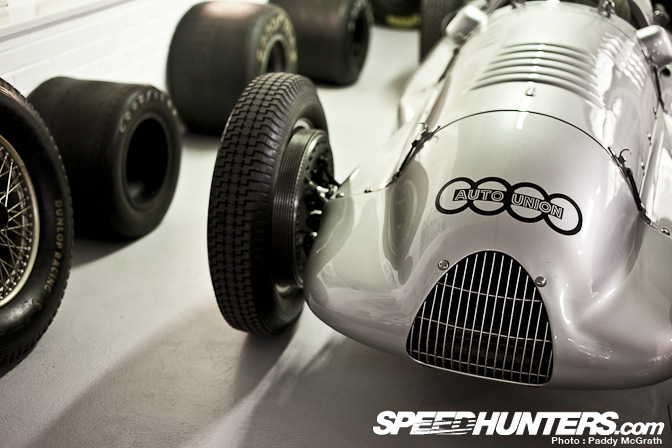 more pics of the Auto Union please. First picture for wallpaper please! Is this open to the general public, i live local to donnington and never thought of going down, also is there any bikes there? 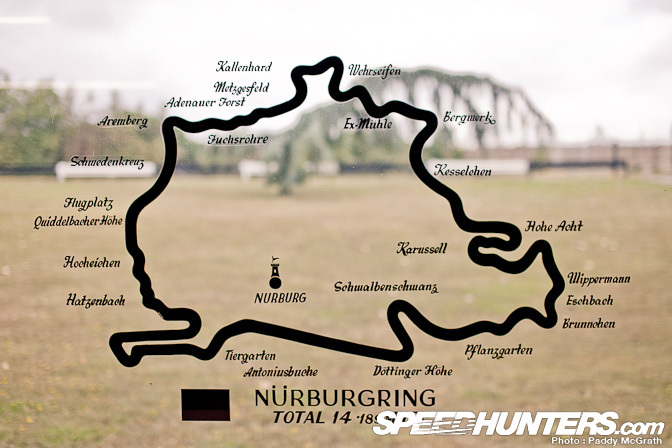 would never have thought that they had that many historic car judging by the way the enterance looks!! Wow, I was just at the place a few weeks ago. Amazing collection. Thanks Paddy, this is a totally awesome post. I hope you have more for another one? 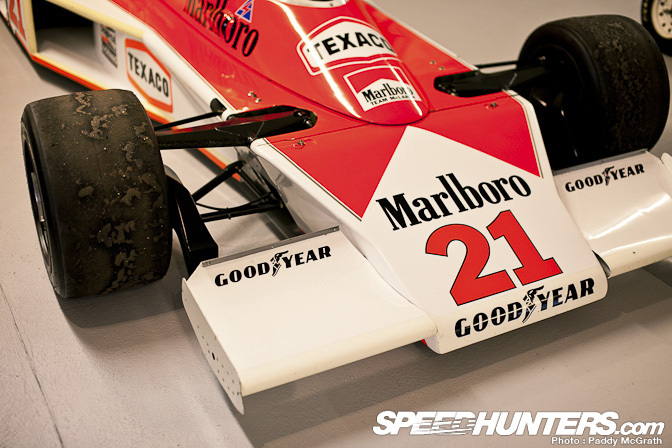 I love these old GP cars.